← The Lion The Ditch and the Microbes. So, this mornings faux pas started when I asked my lip- locked fellow flyers if I could get past them to sit at the window seat ( note to self, if claustrophobic on one hours sleep- book the aisle.) Schoolboy error. I smiled at the female couple and brightly enthused “Excuse me, ladies.” It turned out that the slightly butch woman with curly hair that mushroomed out from beneath her Belinda Carlisle hat, was in fact a young man; who spoke good English and was now wearing a frown that was more distinctive than his hair. Cue 2 hours of the enraged couple feigning sleep, after I had drank 2 teas and a litre of water. There was no way this window seat girl was getting out to the loo. It was warm when I disembarked andI quickly located the ladies ( bathroom- not the couple). I had been up effectively all night worrying that I might miss the flight. I was delighted to be greeted at Hotel Miramare, by one of the lovely hosts and the design boutique hotel did not disappoint. The bed was comfortable, the bathroom all dark granite chic and a modern painting of a curvaceous woman with a cascade of green hair black gloves and a small plate of cupcakes was painted on the ceiling. Every room in this hotel is unique and branded with its own style. I stayed in a room previously, that had all manner of items stuck to the ceiling as part of an installation and whiled away the hours deciphering what each piece of the installation was- one item included a small fire engine sprayed gun metal grey. Impossibly tanned, thin women were crammed into the marina district’s restaurants eating copious amounts of pasta. I am convinced that they only eat in the tourist season to annoy Brits and Germans- in the same way that they rock around London looking chilly in puffa coats during a London heatwave. My wavy hair had adopted its usual triangular mop look, giving me a sort of Bojo crossed with a sheep dog look. A far cry from the glossy raven- haired tresses of the inhabitants, who can still wear high heels at the age that most old ladies are in the UK are nodding at Dame Thora Heard -as she agonisingly makes her way up the stairs in the good old Stena Chair Lift. I stopped for coffee and smiled remembering the Italian chap at the airport who was ignoring his girlfriend for the attention of two young teachers from Cork. One of them seemed quite enamoured, until he mistook her sing- song lilt and asked her which part of Germany she came from? I spent hours, wearing my “respectable clothes” which felt a bit like wearing an antique diving suit and sitting on a sun bed, as the temperature soared. I had also forgotten my sunglasses, so the dark circles under my eyes were set off by manic squinting as I climbed the Castello district looking for somewhere to live. After four hours of estate agent hunting, I surrendered to dinner. The heat had abated and I happened upon a delightful restaurant at a crossroads. The adjacent nightclub, started to soundcheck and as the bass switched on and off, I noticed another sound and on the other side of the street, sung mass had begun. It was all sounding quite gregorian and then the nightclub rocked out some Slayer. The Priest however, who had flung open his doors welcome in the sheep among the wolves, defiantly found a microphone and proceeded to sing louder. I was stuck in the crossfire of the would- be canonised and the would be Anti- Christ, as a Marilyn Mason track shrieked out from the club. The waiter’s pretended they could hear neither. A scowling widow in black appeared outside the church door, looking ready to do battle with Satan himself and then whipped out a Samsung phone from somewhere in her black garb and stood at the open doors of the church making a call. Various tourists passed the church and peered in, some taking photographs. I noticed that once they had taken Communion the old folks left. Perhaps sensing their time was precious, they didn’t wait until the end of the service. They had had their blessing and were off out the door, some of them hanging around to have a chat, some disappearing off for a game of dominos.The faded glamour of The Valencian – style buildings, cast shadows in the evening light and women hung out their washing on old fashioned washing lines beneath impossibly high wooden shutters. The buildings looked as if they had wilted in the heat, as the plaster eagerly escaped the walls. I meandered back through the streets and down past the colonade where a man has mice run over apparently happy cats, as a spectacle. Having been up all night, I decided to turn in with the green haired lady and good book. 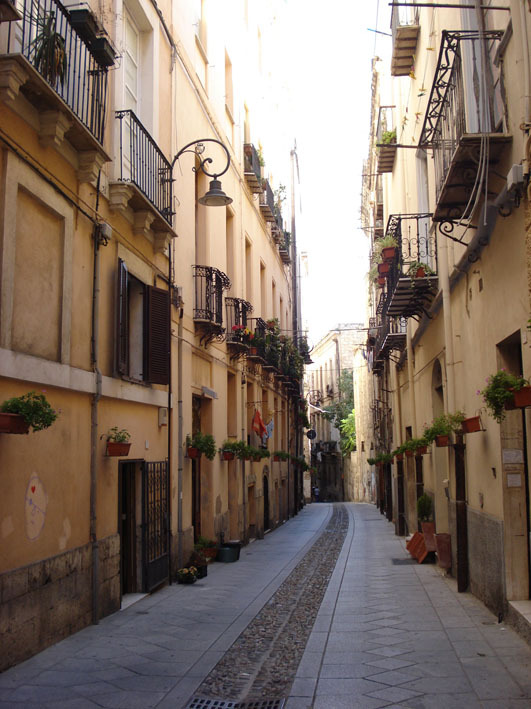 This entry was posted in travel, Uncategorized and tagged Cagliari, Italian women, Italy, Sardinia EFL teacher., Travel. Bookmark the permalink.